Do you need to merge multiple MPC projects together? Looking to work on a project in both ‘standalone’ and ‘controller’ mode? Do you need to optimise project memory? In this article I answer all these MPC X & MPC Live project-specific questions and more – if there’s anything you think should be added, let me know in the comments! What is an MPC project? A project in the MPC Software is a working environment that typically represents a single song or beat. It holds all the resources you need to work on that particular song such sequences, programs, kits, instruments and samples. When you save a project to disk it creates a ‘snapshot’ of everything within your project at the moment of saving so when it’s re-loaded you can carry on exactly where you left off. How do I create a new MPC project? To create a new project, simply hit the NEW button. One way to save a project is to use the via the SAVE button in the PROJECT panel. You can also hit the DISK icon at the top of the page in the MENU screen. Additionally in the MPC X you can save by holding down SHIFT and pressing the BROWSE button. If this is the first time you’ve saved the project you’ll be asked to give it a name and choose a location to save the project to. When you save a project, the MPC creates an XPJ file which is a text file containing all the project settings; it also creates a separate ‘ProjectData‘ folder which contains all the actual sounds, programs and sequences used in the project. 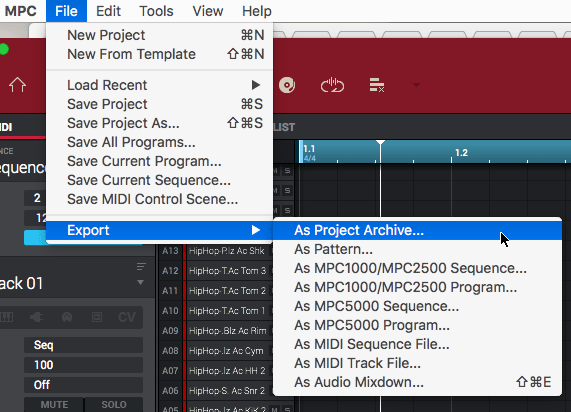 You can also set your MPC to automatically save your project at regular time intervals – go to MENU, hit the gear icon at the top of the screen, hit AUTO SAVE > ENABLED and select the desired saving frequency. How do I load a previously saved project into memory? Double tap the project file to load it – if you have a currently unsaved project currently in memory you’ll be asked if you wish to save that one first, otherwise you’ll lose any unsaved changes. Set ‘NEW PROJECT DIALOG‘ to ‘Demo/Template/Recent‘; now when you boot up you’ll have the option to ‘OPEN A RECENT PROJECT‘ along with the option to select one of many ‘genre’ blank project templates or one of the built in demo projects. 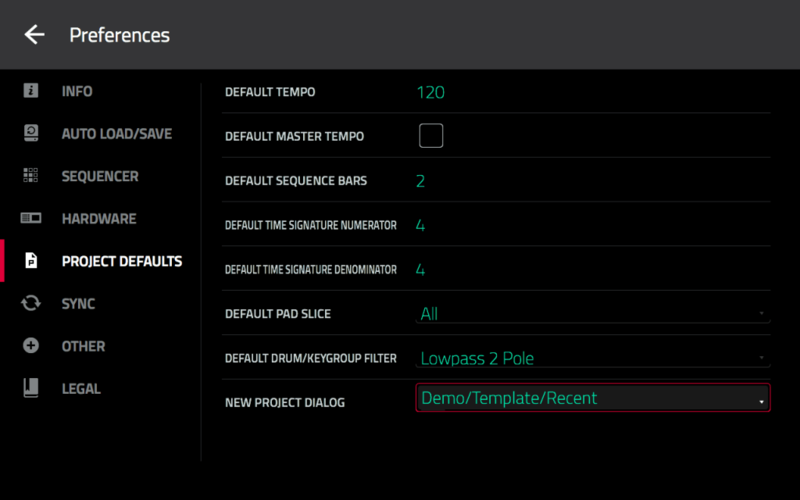 Also note that in the PROJECT DEFAULTS page you can set a number of different default project parameters such as default sequence tempo, bar length, and time signature. You can also configure a number of default program parameters here as well. Can I rename an existing project? Yes, first load up the project you want to rename and then from the PROJECT panel select SAVE AS and choose a new project name. Just be aware that the original project (including its ProjectData folder) will still exist on your disk. Can I load multiple projects into memory? No, you can only work on one project at a time. If you are creating a multi-song set for a live performance your best option is to combine all your songs into a single project (see below for ideas on how to do this). How do I re-use kits & sequences from different projects in an MPC X or MPC Live? While there isn’t currently a way to easily ‘merge’ multiple projects together, you can certainly pull resources from one project and load them into another. Enter the ProjectData folder for Project B (i.e. [Project B_ProjectData]), locate the kits and sequences you wish to import into project A and load them all into memory. Now when you save Project A those resources from Project B will also be saved as part of Project A. Choose a save location and hit SAVE. Now back in MAIN select a track that is assigned the program that you wish to copy and hit the bottom row pencil icon. 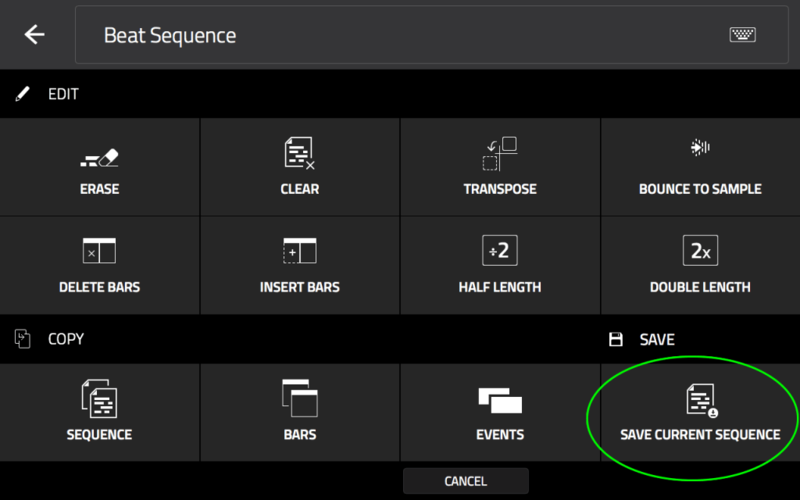 Select SAVE CURRENT PROGRAM and save the program to the same location as your copied sequence. Now load Project A and in the BROWSER, navigate to the location where you saved your kit and sequence and load them into your current project. How do I open a ‘standalone’ MPC X or MPC Live project in ‘controller’ mode? As you cannot access the internal 16GB drive from ‘controller mode’ the best way to work on a project in both standalone and controller mode environments is to permanently locate that project on an ‘attached disk‘; this is any disk that is currently connected to your MPC Live/MPC X, be it an SD card, USB drive or an internal SATA disk. In controller mode these attached disks will appear as removable drives in your computer. 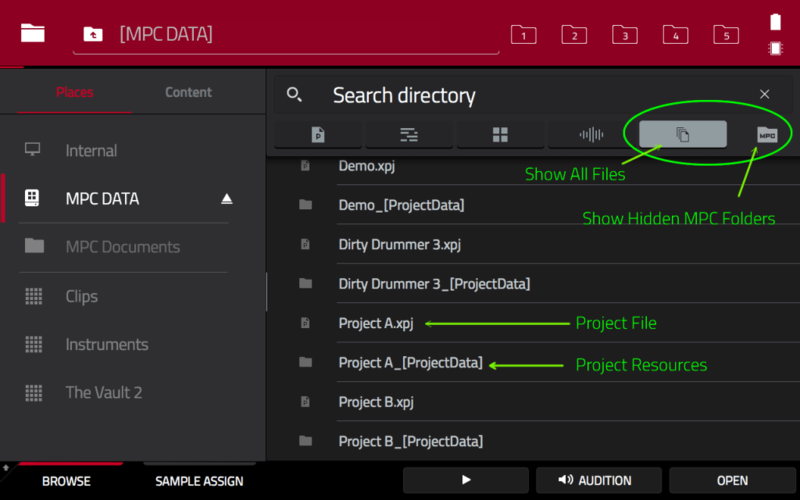 Once you’ve connect via controller mode (MENU > MPC ‘chip’ > CONTROLLER MODE), go to the BROWSER, navigate to your MPC X/Live disk, locate the project you wish to work on and load it into the MPC Software. When you are finished, remember to SAVE it and the next time you return to ‘standalone mode’ you can carry on where you left off by loading the project directly from your attached disk. How do I move projects already saved to the internal 16GB drive? If you’ve already saved your projects to the internal 16GB drive you can easily transfer them to a different disk. First load up your ‘internal drive’ project into memory and then use the ‘PROJECT panel > SAVE AS’ option to save a copy to a second, removable disk, such as a USB stick or SD card. Repeat this for any other ‘internal drive’ projects you wish to transfer. I would suggest only using the internal 16GB drive as a ‘read only’ drive for access to the included ‘Vault 2’ kits and instead save all your work to ‘attached disks’ instead. I currently use this 128GB low profile USB 3.0 drive without any issues; it’s fast and only protrudes by approximately 6mm from the back of my MPC Live. How do I archive my old projects? Once copied they can be deleted from the MPC disk. Remember to empty the ‘Trash/Recycle Bin’ on your computer while the MPC disk is connected to correctly free up the disk space. Choose a destination and name for the archive and hit SAVE – you can now delete the original project files and just store the XPA archive instead. The advantage of using XPA files over more generic compression options such as zip or rar is that the MPC BROWSER recognises XPA files, even in the ‘standalone’ browser, so you can easily re-load an archive project, even without a computer to hand. Select an XPA in the BROWSER, hit LOAD and you’ll be shown the SAVE screen. The MPC is now asking you for a location to de-compress the archive to. Choose a name and location, hit SAVE and the MPC will de-compress the XPA, eventually recreating the original XPJ and ProjectData folder on your MPC disk. If you are decompressing an XPA in an MPC Live or MPC X, be patient, the decompression process takes a while and the MPC doesn’t give any on-screen messages until it near the very end of the process. How do I optimise the memory used in my projects? Go to the PROJECT panel and hit PURGE. 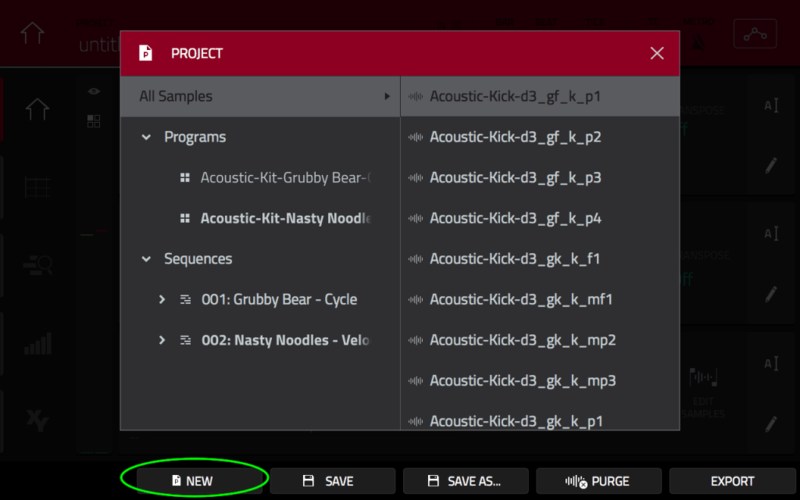 This will delete all ‘unused’ sounds from your project – an unused sample is any sample that is not currently assigned to a program. Only use stereo samples when it’s truly necessary, i.e. when the sample contains panning information. 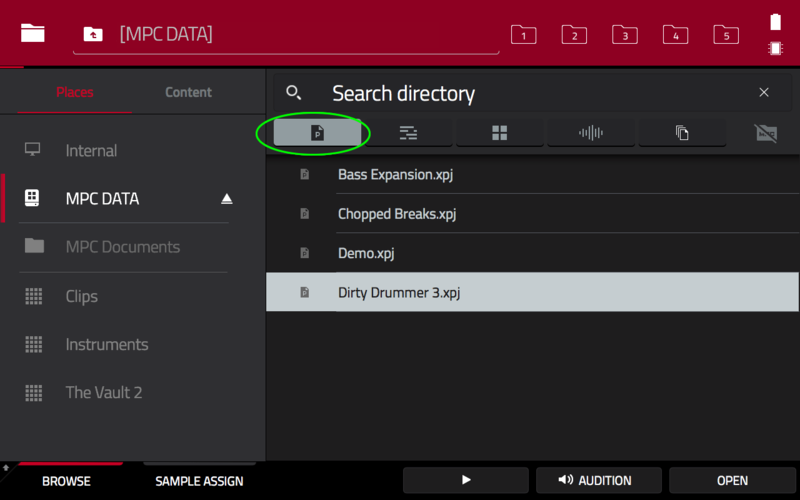 ‘Top and tail‘ your sounds and ‘DISCARD‘ any sample data that is not required. Try to use ‘non destructive‘ sampling and chopping techniques where possible as these avoid creating duplicate sounds unnecessarily (e.g. convert chops using the ‘non-destructive slice’ option, use program pad parameters etc). New to the MPC X or MPC Live? 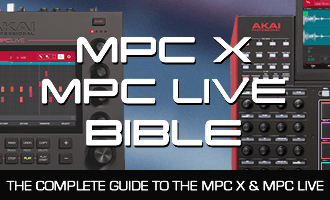 Check out my ‘MPC X & MPC Live Bible‘, the definitive beginner’s guide to the MPC X & MPC Live, containing carefully structured, hands-on MPC X & MPC Live tutorials, tips & tricks, all continually updated to ensure full compatibility with the latest MPC firmware. Keep these coming mate, Cheers! In this article there is a statement that the Live/X “have approximately 600-700MB of available memory to work with”, but in the lab test it’s stated to “have approximately 1130 MB of usable RAM available”. What would you guess for an accurate figure in August 2018?